Captain Dan Clymer was born and raised on the Crystal River. He has been fishing the CitrusCounty waters his entire life. At a young age he learned the vast bottom terrain these waters have to offer for fishing. Being an avid fisherman and having a passion for teaching others how to fish, he obtained his Captain license at the early age of eighteen. Captain Dan has worked several years in the marine industry including sales and actual field work testing boats. Over the years, the hours riding and working on a boat have accumulated over the thousands. 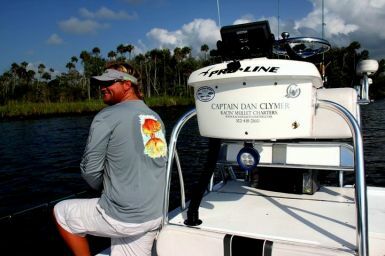 Some of Captain Dan’s fishing specialties include offshore grouper, flats, back country and fly fishing. While offshore, grouper, snapper, cobia, and king mackerel are the Captains target species. He is a true master of shallow water grouper fishing and on most occasions catches his grouper limit within site of land. This shallow water grouper fishing is a unique characteristic for the Homosassa and Crystal Rivers. While fishing inshore, Captain Dan focuses on redfish, trout, and snook. He enjoys taking his charters throughout the vast back country and flats of Citrus County. Fly fishing is also available for all the inshore species and some offshore species. Captain Dan is always up to the challenge of putting an angler to the ultimate test of catching a fish on the fly. Some of Captain Dan’s credentials include several TV appearances such as Hooked on Fishing with Captain Bill Miller, Florida Sportsman TV, and Nature Coast Outdoors. He has also had several articles written about him and his fishing techniques of the Citrus County waters published in magazines such as Florida Sportsman, Saltwater Sportsman, Center Console Angler and Sport Fishing Magazine. Captain Dan’s most recent credential has expanded to include being federally permitted by NOAA and writng the fishing forecast for Gaff Magazine. Captain Dan will ensure a great day on the water. His boat can comfortably fish one to four anglers. All bait, tackle, and licenses are included with the charter. An angler only needs to bring their personal belongings along with food and drinks for the day. He looks forward to achieving the most memorable day of fishing Citrus County waters has to offer.